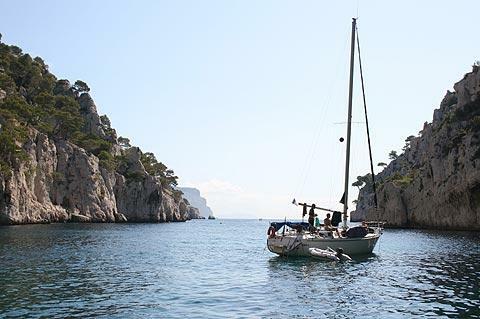 One of the highlights along the coast of southern France, the calanques are a series of limestone cliffs, fjords and rocky promontories plunging into the Mediterranean along about 20 kilometres of coastline between Marseille and Cassis in Provence. In places there are pine trees clinging to the gleaming rock, adding further to the dramatic appeal. 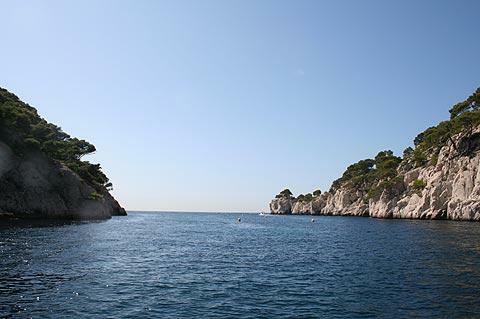 The Calanques are found along the coast to the south-east of Marseille, and are usually accessed from the attractive harbour town at Cassis. 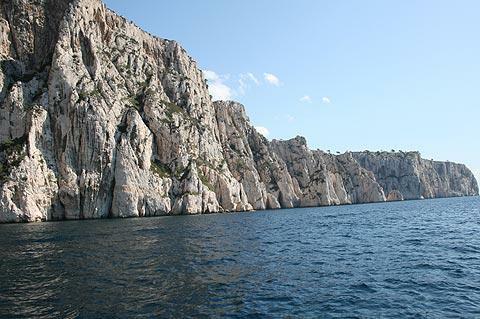 The coast and surrounding countryside to the east of Marseille has now been designated as the Calanques National Park, one of just seven French national parks on mainland France. The calanques around Cassis are the most accessible to visitors, while En Vau, a little further to the west, is perhaps the most beautiful because of the height of the cliffs here as well as the beach and rocks sticking out of the water. 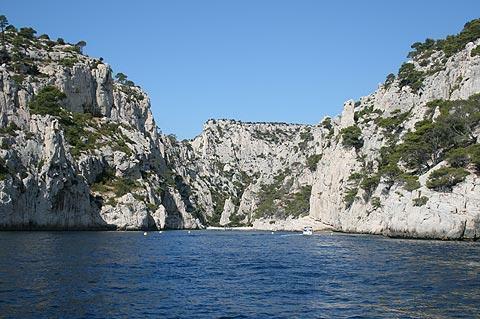 In places along the calanques the cliffs reach a height of 400 metres. Heading west from Cassis the calanques (in order) are: Port Miou (easily reached on foot from Cassis), Port Pin, En Vau, L'Oule, Devenson, L'Oeil de Verre, Sugiton and Morgiou. Morgiou and nearby Sormiou, to the west of the calanques, can also be reached by road. France This Way comment: this is one of our favourite stretches of coast in France and we highly recommend you take the trip along the calanques from Cassis if you are in this region! As well as being a scenic attraction there are also several small beaches set among the rocks, with pine trees climbing the hill behind the beaches, for example at En Vau and Port Pin, where you can swim between the cliffs - very dramatic! 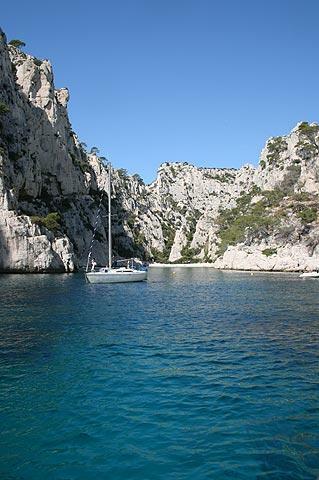 One particularly stunning way to see the calanques is by taking a boat trip from Cassis along the coast. Tickets for the boats are available in the harbour at Cassis - 13 euros to visit three calanques (45 minutes), 15 euros to visit 5 calanques (65 minutes) and 19 euros to visit eight calanques (90 minutes). Whichever boat trip you choose you won't be disappointed, as the little boat travels around the beautiful coastline with a new surprise around each corner. After many years of exploring much of France I still consider the boat trip I took here as one of my favourite days out! The other option to explore is on foot by hiking along the coastline - this region really is a walker's paradise. 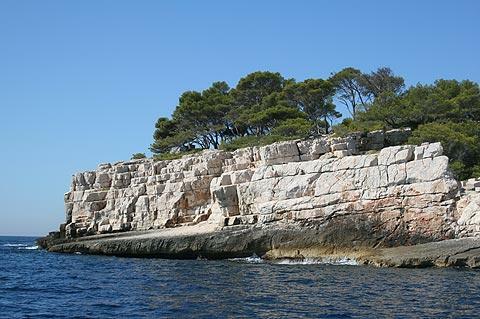 There are also designated climbing areas in the calanques. Note that because of fire risk, there are significant restrictions on access to the inland regions, especially during July and August. The coastline around the Marseille calanques is very popular with divers, although this is perhaps not the easiest way to get a good look at the calanques as a whole!. Note - the underwater Cosquer cave at Morgiou contains some of the oldest cave paintings in the world - said to rival those at Lascaux. Unfortunately the entrance is 35 metres under water and access is prohibited even if you do come equipped with diving equipment! There is a beach at Cassis and the town itself is pleasant to explore. 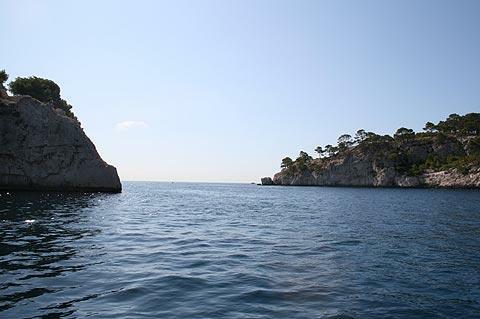 Heading east from Cassis you should follow the coast road towards La Ciotat for more impressive coastal scenery. You can find more local travel ideas in the Bouches-du-Rhone guide and the Provence guide.